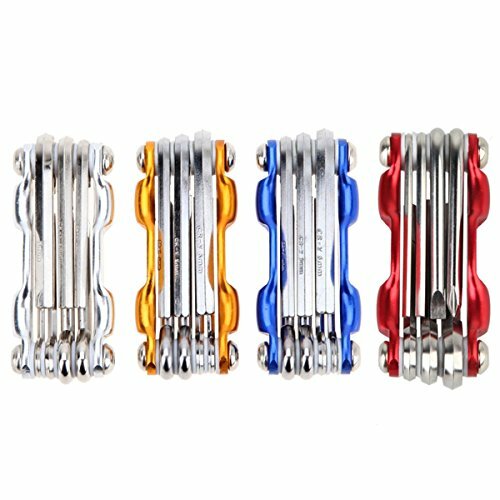 Bike Multi Fixing Tools- 7 in 1 Bicycle Tools Sets Mountain Road Bike Multi Repair Tool Kit Socket Head Wrench Cycling Screwdriver Tool Multi Tool by BKVT at Melon City Bike Club. MPN: E-152. Hurry! Limited time offer. Offer valid only while supplies last. Material: Carbon Steel Socket Head Wrench Specifications: 3/4/5/6mm Screwdriver type: Flat head screwdriver, cross screwdriver Folded size: Approx. If you have any questions about this product by BKVT, contact us by completing and submitting the form below. If you are looking for a specif part number, please include it with your message.